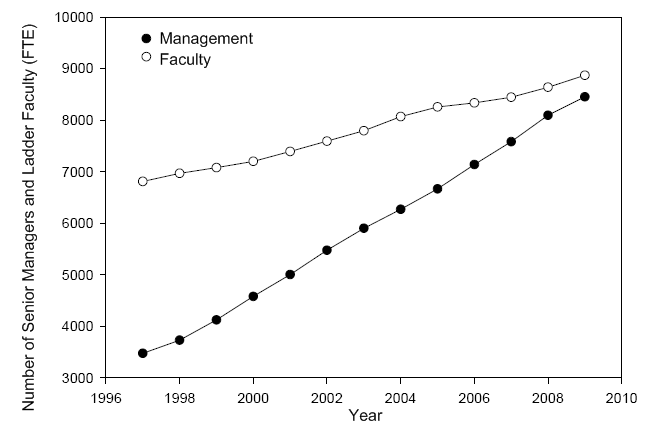 In the decade beginning in 1997, while faculty increased by 24 percent and student enrollment increased 39 percent, senior management grew by 118 percent. Where I work we do worry a bit about future finances. To preview that future I naturally look to California, where I grew up, since we always liked to think of ourselves as leading the way in everything from psychedelics to electronics. And certainly it has been leading the way of late in the field of problematic public finances, so perhaps this is the shape of things to come. The most visible aspect of the US military is its role as what Tom Lehrer called America’s “number-one instrument of diplomacy“. Whatever your views of it in that capacity, it is best not to overlook the fact that this very large, well-funded and technologically ambitious organization also affects our lives through its procurement and management practices. You know some of the stories: the invention of the Internet; bringing the production of transistors quickly to a commercially viable scale by mandating their widespread adoption; creating the ISO 9000 quality assurance system for use by its contractors – who, since they included many of the world’s largest corporations, passed them on to thousands of other companies upstream on the supply chain; or, if we go back a couple of centuries, roughly fifty years spent making the concept of interchangeable parts – until then, an un-implementable item of French military doctrine – into an industrial reality (for details on this last, see Hounshell’s great book From the American System to Mass Production, 1800-1932). So if the Pentagon really is shifting toward an open-source approach to software development, you know where to lay your bets.